Checking in on Google+ is a great way to share your location and what you’re doing with your friends. With each check in, a map of the location is shared (that links to Google Maps so you can see where it is in bigger context) along with your post. Open the Google+ app and tap the Stream icon on the splash page that appears. You can skip this step on the mobile web experience. Tap the check box icon in the upper right corner. Google+ automatically lists a few places based on your GPS location. Choose a location, or search for another one and select one. This step takes you back to the posting page. 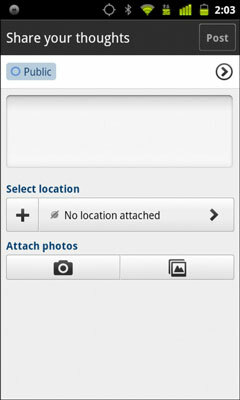 Enter a post to add to your location and attach any relevant photos. Select the circles you want to post to by tapping on the input field at the top with the arrow pointing right (see the following figure) and typing in the name of the circle or circles you choose. The basic posting screen on Google+ mobile apps (may vary slightly by device).